The following dialogue is repeatedly voiced in most Indian marriages: “The darker the color of mehndi, the greater the love of one’s spouse”. Now, such a futuristic assertion may sound exceedingly farfetched; but it nonetheless bestows a significant glimpse at the paramount importance held by the mehndi ceremony in an Indian wedding. A pre-wedding ritual organized by the bride’s family, it involves much revelry and is an opportunity for a blissful congregation of long forgotten near and dear ones. During the ritual, a paste of dried powdered henna leaves is applied on the hands and feet of a bride in the form of intricate patterns that often artistically disguises the initials of the groom. Significantly, a groom may also put on mehndi, but it is not a compulsory ritual for all cultures. The ceremony is observed with gusto not only in the Indian subcontinent but also in Nepal, Pakistan, Bangladesh as well as in many Arab countries of the Middle East. The Hindi and Arabic word, “mehndi” has a long history. Derived from the Sanskrit term, “mendhika,” referring to the henna plant, it was used as a cosmetic in the Indian subcontinent before the Vedic ages. In fact, the manner of using mehndi for body art is believed to have originated from India itself, spreading to other parts of the world like Asia Minor, Egypt, and the Middle East. Islamic literature puts forth the view that mehndi was used by Prophet Muhammad to dye his beard and he also gave it to those who were sick. Certain sources also claim that the Egyptian queen, Cleopatra, used it to decorate her body. Boasting of being one of the earliest forms of body art, it is held sacred by various traditions worldwide, chiefly, the Hindus, to whom it represents one of the necessary 16 adornments of a bride. Usually taking place in the morning, a day before marriage, this women-centric ritual generally involves a host of interesting activities. Invitations are given beforehand to relatives and friends to assemble on that particular day. The venue is decorated suitably with flowers and draperies. The bride usually wears a light yellow colored lehenga with short sleeves. Stunning floral jewelry and bright makeup are also part of the ceremony. The groom normally gets attired in vibrant kurta-pajama. Radiant outfits are also put on by family friends to be in tune with the vibrant occasion. It is the responsibility of the groom’s family to send the henna to the waiting bride along with gifts such as dry fruits and sweets. As the henna arrives, the respective bride’s hands and feet are adorned with it by either an experienced relative or a professional artist. Designs, generally starting with the front and back of palms, extend till above one’s elbow and are also done on feet. While the application is in progress, elderly relatives help in creating a musical environment by singing popular mehndi songs with dholaks. Other female friends and relatives either dance or get their hands adorned by the paste, though their patterns are not so elaborate. It is important to note that while merrymaking is in full sway, some etiquette are still maintained, like the unspoken ban on black dresses since the color symbolizes bad luck and the fact that everyone should take off their shoes at the site of the ceremony. Henna is a medicinal herb, and when applied in a paste form on the palm and feet, it provides an exclusive coolness, thereby keeping away the much dreaded pre-wedding jitters. Apart from being a potent antiseptic agent, it also boosts blood circulation, helping with overall health. The ceremony, serving as a perfect setting for the harmonious gathering of relatives and friends, embodies India’s rich culture. 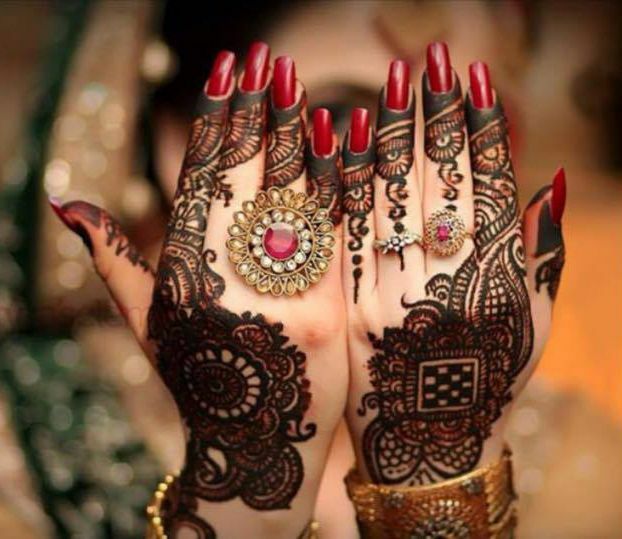 In earlier days, when a newly wedded bride returned to her father’s house with her hands retaining the dark color of mehndi, it reflected the caring attitude of her in-laws. Even today, the shade’s vibrancy symbolizes the warmth and understanding existing between a bride and her respected mother-in-law. Mehendi patterns have undergone changes with time. Along with traditional motifs like that of the peacock and flower, many would-be brides nowadays go for Arabic designs that put a lot of emphasis on vines. According to latest trends, colors are put in between henna designs with added stones and glitters. Modern variations even include geometric designs and white henna patterns. 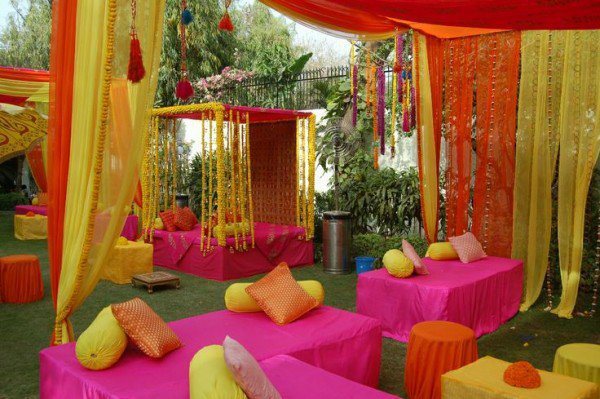 Indian weddings are increasingly colorful, intrinsically vibrant and essentially unique. And a mehndi ceremony acts as the perfect prelude – signaling the onset of a blessed occurrence and simultaneously coloring it with absolute piety. So, come and indulge yourself in this splashy extravaganza to create unforgettable memories for life.